An important part of the BRT planning carried out by Far East Mobility experts in Guangzhou, Lanzhou and Yichang involved labour-intensive on-bus surveys to document boarding and alighting passengers and bus speeds for all bus routes of interest, with at least five AM peak hour samples for each route and up to 50 samples for some routes. This data was one of the main components of the modelling process developed and applied successfully in the planning of all three cities' BRT systems. On-bus surveys are slow. In pre-BRT conditions bus speeds are often as low as 10-15km/hr, and for many routes only one peak hour sample may be possible in each 1.5 hour AM peak period (usually 7:30-9:00am). Since 'routes of interest' even in a medium-sized city such as Yichang usually number at least 50, if only one sample per direction is possible during each peak hour, a sample size of five trips per route requires 250 person-days of survey personnel input. With a reliable 5-10 person survey team, including preparation and data processing the survey requires around two months. In larger cities and/or longer BRT corridors, there may be around 100 or more BRT routes affected. If consideration of all main urban routes is required, or a future BRT plan is required, even in a medium-sized city such as Yichang this would require boarding and alighting analysis of more than 130 routes, and more than 200 routes in larger cities. The time and cost requirements were minor compared to the work required to carry out an on-board survey. Compared to more traditional approaches, the approach applied by Far East Mobility experts in Guangzhou, Lanzhou and Yichang was very efficient and in Yichang's case enabled the completion of a detailed BRT conceptual design in less than 6 months. Moreover, in each of these cities there were pre-existing studies and surveys but all had to be discarded for various reasons. The pre-existing data and surveys was not reliable. For example, an earlier study in Yichang had surveyed bus speeds bus using only minutes, not seconds, so the resulting data was useless. A transfer survey had surveyed transfer passengers but had not recorded the non-transferring passengers, so it was impossible to know the proportion of transferring passengers, rendering the survey useless. The only exception was that in Yichang the bus company was able to provide detailed and reliable GPS data for bus speeds. 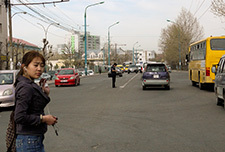 In Ulaanbaatar in early 2016, for the first time, we came across a set of existing data based on smart cards which was actually reliable and usable, and meant that even the efficient survey method based on on-board surveys of routes of interest was not required. The smart card data has various problems and required a lot of cleaning, but the time and cost requirements were minor compared to the work required to carry out an on-board survey. The smart card data provides a wealth of data which is comprehensive as well as very accurate. Trip matrices based on this data, adjusted with transfer surveys at key locations (which the smart card data also indicates, since alighting card scanning takes place in a larger proportion at high transfer locations, due to transfer discounts), will result in much more accurate data than can be gleaned by modeling approaches based on household surveys. And the data is more comprehensive than the on-board approach, becuase it includes all routes, not only those which are defined as 'of interest'. Far East Mobility surveys showed that the smart cards were used by 49% of peak hour boarding passengers in April 2016. The smart card data is supplemented by an excellent Android application developed by the Smart Card Company, called UB Smart Bus, which provides real-time information on all buses due at a particular stop. This is useful both for waiting passengers and for reducing the need for bus frequency surveys, as the arrival information is very accurate and covers all buses equipped with smart card readers, which is now the large majority of the city bus fleet. 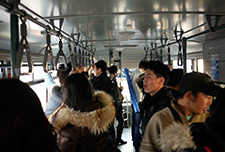 Data from the Ulaanbaatar Smart Card Company was edited and analysed by Far East Mobility to produce highly reliable bus speed and bus route information which would have otherwise required months of intensive input by a survey team. 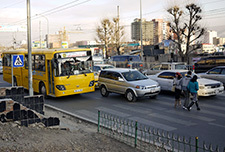 This data can form the basis of ongoing BRT planning and model development in Ulaanbaatar. The UB Smart Bus Android application is very useful to passengers and also can assist with the BRT planning.